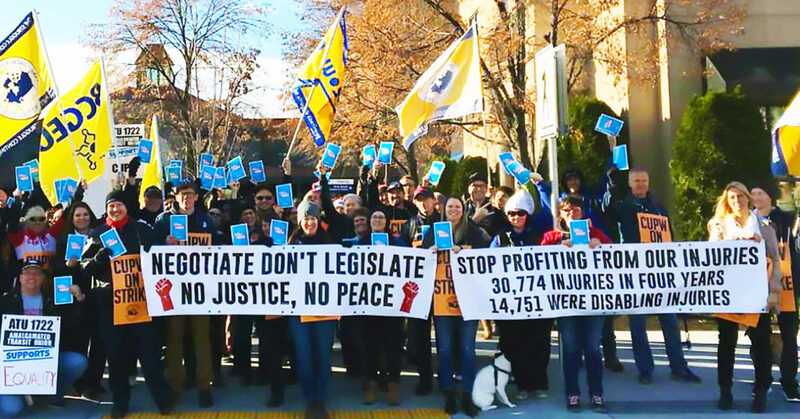 The Communist Party of Canada extends its full and active solidarity with postal workers who have been on rotating strike since October 22. The Communist Party demands that Canada Post put forward an offer that addresses the needs of its workers and that the federal government honour the rights of workers to strike and bargain free from back-to-work legislation and intimidation. Almost one month ago, the 55,000 members of the Canadian Union of Postal Workers began a series of strikes to pressure Canada Post Corporation to agree to just collective agreements that serve the best interests of both the urban operations unit members, and the rural and suburban mail carrier workers. The strike comes after almost a year of bargaining, and after the union received resounding strike mandates from both bargaining units. The key issues for the union are pay equity for rural and suburban mail carriers, health and safety issues and longer hours and over work for letter carriers, because of the large increase in parcel delivery in recent years. Injuries have increase 43% over the last two years. CUPW members have five times more injuries than other workers in the federal sector. Along with injuries, the Canada Post Corporation’s drive to increase workload has brought extended hours of work. Postal workers are continuing the fight for the 8 hour day and 40 hour work week at the same time as workers in various sectors are increasingly forced to work longer hours. The demand for pay equity is part of a broader demand for gender equity in the public sector and for the rights of women workers across Canada. The issue is pay equity between the Rural and Suburban Mail Carriers, mostly women, who earn 28% less than urban letter carriers, who are mostly men. When a committee established under the last collective agreement failed to resolve the issue, an arbitrator ordered the Corporation to do so. Postal workers are fighting to have pay equity resolved through this round of bargaining. CUPW is also working to re-frame the discussion about the role of the public sector of the economy, pushing back against neoliberal politicians and the corporate media who claim that every government asset and service should be privatized. Instead of cuts and privatization workers are fighting for progressive reforms and expansion of Canada Post, such as Postal Banking, reestablishing door-to-door delivery, introducing a fleet of electric made-in-Canada postal vans and extending broadband services to rural areas. The CUPW “Delivering Community Power” campaign is an important strategy to win working people to the understanding that banking and many other services can and should be provided by the public sector, not by profit-hungry corporations. In 2011, the Harper Tories imposed back-to-work legislation on postal workers, which resulted in the loss of rights that postal workers are still struggling to win back. Now the federal Liberals have started to issue threats to do the same as Trudeau declares that “all options are on the table” as the strike begins to enter the holiday season. These threats in themselves are an attack on workers’ rights. The Communist Party demands that the federal government respect labour rights: the right to strike and bargain. Furthermore, the federal government should direct Canada Post to put forward an offer to the union that addresses the just demands of postal workers. The federal government must also work in good faith to expand publicly owned services such as Canada Post instead of continuing to lay the ground work for privatization and the selling of public assets to Bay Street. Door-to-door mail delivery, cut under the Harper government, must be fully restored and the proposals put forward in the Delivering Community Power campaign enacted. The Communist Party of Canada calls on the labour movement and community organizations to organize solidarity for the strike by joining picket lines when workers are out in their communities and to support the struggle to expand Canada Post through the Delivering Community Power campaign. Victory to postal workers!